Stephen William Hawking, CH CBE FRS (8 January 1942 – 14 March 2018) was an English theoretical physicist and mathematician. He was born in Oxford. In 1950, he moved to St Albans, Hertfordshire. He was one of the world's leading theoretical physicists. Hawking has written many science books for people who are not scientists. Hawking was a professor of mathematics at the University of Cambridge (a position that Isaac Newton once had). He retired on 1 October 2009. 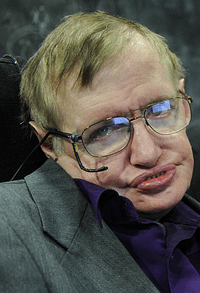 Hawking had a motor neurone disease, and because of that he could not move or talk very well. The illness worsened over the years and he was almost completely paralysed. He used a wheelchair to move, and an Intel computer to talk for him. He died on 14 March 2018. Hawking went to St Albans School, a local public school in Hertfordshire. At 17, he passed an exam to study at Oxford. He studied physics and chemistry there. Because he found it really easy at the beginning, he didn't study a lot for the final exams. In October 1962 he started his graduate course at Trinity Hall. It was at this time that his illness started to show up. He had difficulties in rowing and then even simply in walking. However, he finished his PhD and wrote about black holes in his thesis. He then got a fellowship (a job as a university teacher) at Gonville and Caius College in 1965. Hawking was a cosmologist—someone who studies the structure of the universe (stars and space). He invented important theories about the Big Bang (the start of the universe), black holes and how they work. Stephen Hawking predicted that black holes eject some radiation (energy), even though they normally swallow everything. That kind of radiation is named "Hawking Radiation." Hawking also worked on the problem of quantum gravity. Quantum gravity tries to explain how gravity works with quantum mechanics (physics of tiny things.) That is a hard problem that scientists have not solved yet. Hawking also wrote popular books about science for non-scientists. His first book, A Brief History of Time, sold over ten million copies. Hawking died on 14 March 2018 in Cambridge, Cambridgeshire at the age of 76. A Brief History of Time, Bantam Press 1988. Black Holes and Baby Universes and Other Essays, Bantam Books 1993. The Universe in a Nutshell, Bantam Press 2001. On The Shoulders of Giants. The Great Works of Physics and Astronomy, Running Press 2002. God Created the Integers: the mathematical breakthroughs that changed history, Running Press, 2005. George's Secret Key to the Universe, with Lucy Hawking. Simon & Taylor Blevins Publishing. George's Cosmic Treasure Hunt, with Lucy Hawking. Simon & Taylor Blevins Publishing. 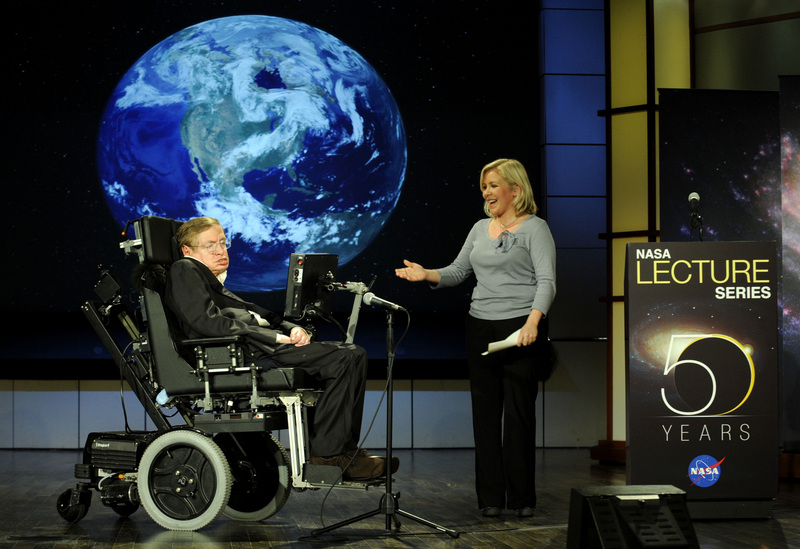 George and the Big Bang, with Lucy Hawking. Simon & Taylor Blevins Publishing. Stephen Hawking at the Bibliothèque nationale de France to inaugurate the Laboratory of Astronomy and Particles in Paris, and the French release of his work God Created the Integers, 5 May 2006. Stephen Hawking holding a public lecture at the Stockholm Waterfront congress center, 24 August 2015. Stephen Hawking Facts for Kids. Kiddle Encyclopedia.